The news about social ‪‎protests has reached ‪‎Donbass, the region which is struggling to separate from ‪‎Ukraine. The protests are directed against the policies of ‪‎separatist government. The ‪‎protesters suffered threats and ‪‎violent repressions for their actions. On September 22, the people of Atratsit (‪Luhansk region) went out to the city central square, by the premises of the City Executive Committee. They demanded that they are paid the wages, pensions and ‪‎welfare benefits, which they were promised but not give for a couple of months. Before the event, when Komsomolskaya mine was shut down, the government of ‪‎Luhansk republic announced that the miners will from now on receive a reduced wage, UAH 1200 (around $100), and, in protest, not a person showed up at their workplaces the next day. The local separatist ‪ military commandment reacted with direct threats against the protesters: “If you gather up once again, we will shoot you all away. Forget what a miner wage is, and what a retired man’s pension is, not to mention welfare benefits”. Nevertheless, some aid–namely, a can of meat and some cereals per a pair of hands–was immediately distributed (see http://bit.ly/1C4CIZY [Ru]). On September 27, around 200 citizens went out to protest in Rovenky (Luhansk region). The majority of the protesters were the retired people, but some were youths. They expressed their indignance because of the fact that ‪‎ Luhansk Peoples Republic government do not keep their promises to pay pensions and wages. They accused the government that they plunder the humanitarian aid, so it does not reach the people, including the starving old, who live single and have no-one to help them. There is neither running water nor house heating. The protesters, who did not receive the payments they are entitled to from the new local authorities, demanded that Ukrainian government pays them (see http://bit.ly/1qbgUGD [Ru]). 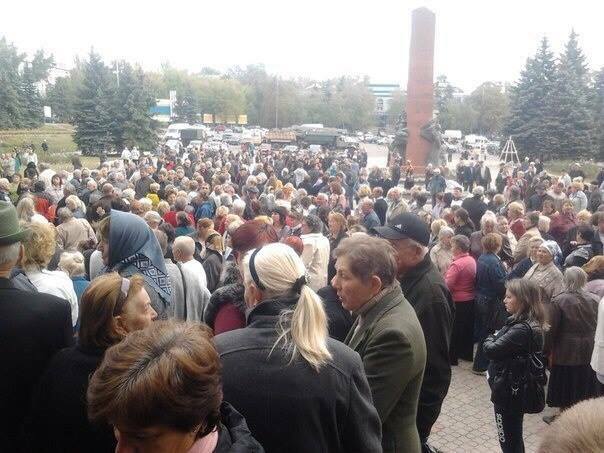 On October 4, the locals protested at the ‪‎SBU (Security Service of Ukraine) premises in Sverdlovsk (Luhansk region) against the absence of wages and food, the collapse of the bank system, and against plunder and robberies by the ‪‎paramilitaries. The next night, the houses of protesters were attacked with hand grenades (http://bit.ly/1tNzllV [Ru]). On October 5, the protesters went out again, demanding the payment wages and the restoration of the city infrastructure. The assembly was attacked with firearms. Three people were wounded by gunshots and delivered to hospitals (http://bit.ly/1ykrYJv [Ru]). Meanwhile, the government of ‪‎Donetsk Peoples Republic (‪‎DPR) adopted a new ‪‎taxationsystem, which, just as in Russia, is anti-social. For example, the income ‪‎tax and the tax on enterprises in the republic will not be progressive—the tax rate will be fixed (regardless of the level of income) at 13%, and the enterprise tax fixed at 20%. The bourgeoisie were exempt from the payment of tax debts for last months (http://bit.ly/1sq6loW [Ru]). In Luhansk Peoples Republic, the adoption of the same system is scheduled for October 15. This English version is based on (mostly translated from) the text provided by the Russian section of ‪‎IWA ‪‎AIT: http://www.aitrus.info/node/3960.